1). Low angle views of the adapical surface of (A) Allomma bonei and (B) Tetragramma variolare. 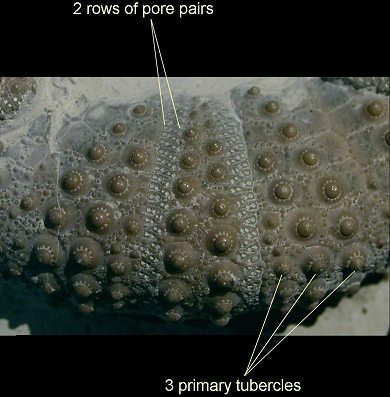 Whilst the ambulacra of Allomma possess rows of single pore pairs (uniserial), Tetragramma may possess double pore pairs (biserial), particularly on the adapical surface of mature individuals. 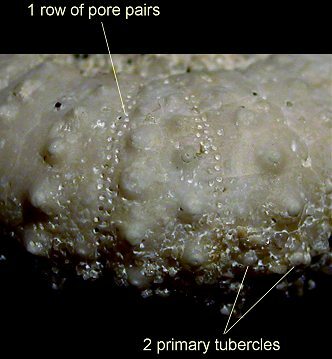 The interambulacral plates of Allomma possess no more than 2 primary tubercles, the second being reduced in size. Tetragramma, however, may possess several primary tubercles per interambulacral plate, which may be of equal size. Tetragramma is also generally larger Allomma. Image B © Booth Museum, by kind permission of John Cooper).